Successful Cafe Interior Design is so much broad definition, it includes a lot of things beginning from the choice of furniture and its placement, and finishing by the elements of design and interior, and by many other little details. 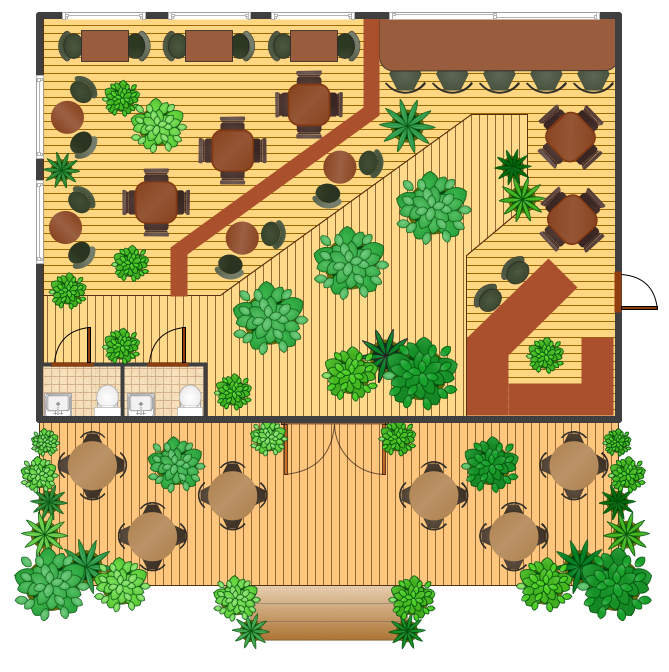 ConceptDraw DIAGRAM offers the Cafe and Restaurant Floor Plan Solution from the Building Plans area allowing architects and designers develop and represent the Cafe Interior Design of any detailing. Cafe and Restaurant Floor Plan Solution proposes the whole collection of predesigned templates and samples of cafe and restaurant floor plans and schematics of furniture layouts. All they are available from ConceptDraw STORE. Using them as the base for your own cafe interior design plans gives you the ability to find the expected result in minutes. Any sample from the offered in ConceptDraw STORE can be viewed and edited according to your needs using the predesigned vector objects of various tables (round, rectangle, corner, etc. 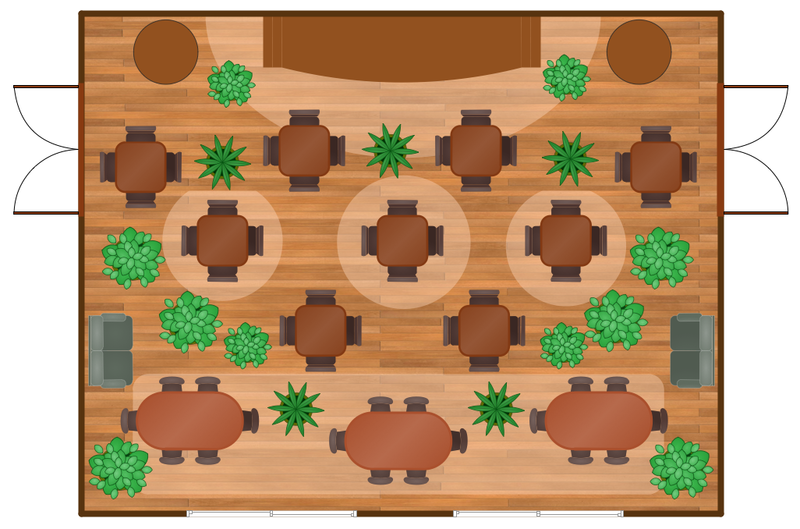 ), chairs, benches, and other restaurant furniture from the Cafe and Restaurant library from the Cafe and Restaurant Floor Plan Solution. The samples you see on this page were created in ConceptDraw DIAGRAM using the tools of Cafe and Restaurant Floor Plan Solution from the Building Plans area. These samples demonstrate the solution's capabilities and the professional results you can achieve. An experienced user spent 10-15 minutes creating every of these samples. 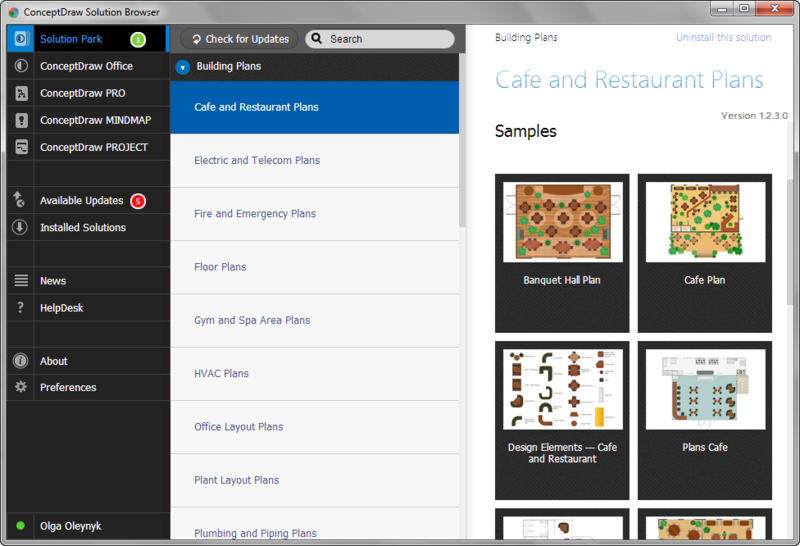 Use Cafe and Restaurant Floor Plan Solution for ConceptDraw DIAGRAM to develop your own Cafe Interior Design Plans quick, easy, and effective. Cafe Decor is one of the most important components of cafe design. Just thanks to the cafe decor elements is created the unique warm atmosphere of the cafe which makes you come back there again and again. ConceptDraw DIAGRAM v12 extended with Cafe and Restaurant Floor Plan solution can help you create Cafe Decor designs simply and fast.